Calling all Schools! Let’s celebrate Earth Month with the 2019 Recycle My Cell Earth Month Challenge! 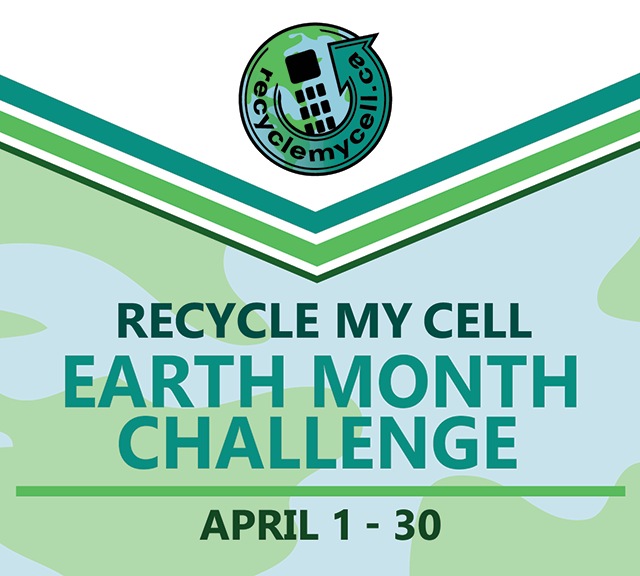 Earth Day is just around the corner, and the Recycle My Cell Earth Month Challenge is a great way to keep old or unwanted cell phones out of landfills, while also giving your school the opportunity to win up to $1,000! Schools must register with Recycle My Cell via the Earth Month Challenge Registration form, located here. Recycle My Cell will ensure an account is established with the processor for your location so that the number of devices collected can be tracked. Recycle My Cell will provide pre-paid mailing labels so your organization can send in the phones at no cost. Please register only once. If you have not received your pre-paid mailing labels within 12 business days of registering, contact us at info@recyclemycell.ca so we can ensure you receive them. Boxes MUST be sealed and returned by the deadline in order to be included in the Challenge. Phones must be collected between April 1st-30th. Phones collected at other times of the year are ineligible for the Recycle My Cell Earth Month Challenge. The winning school in each province will be determined using the number of phones collected per student, based on school population. In order to be eligible for prizes, schools must collect a minimum of 20 devices, though schools that collect less than 20 phones are encouraged to submit their results for proper recycling. In the event that there is a tie, a random draw will occur. A grand prize of $500 will be awarded to the winning school in each province/territory. All schools that collect the minimum of 20 phones will be awarded a participation prize of $1 per phone collected. The maximum combined prize payment per school is $1000. All boxes must be received at the processor by May 13th in order to be eligible for prizing. Any registered Canadian public or Private school, or post-secondary institution. Approval from class teacher/project leader as well as school principal is required to take part. Register for the Challenge by filling out the Earth Month Challenge registration form. Complete school name (no acronyms), school mailing address, and contact information must be submitted in order to take part. Encourage your students to collect all of the cell phones they can! Package up your collections, attach a pre-paid mailing label and battery label, and drop off the box(es) at a Canada Post location near you. Mailing labels will be pre-filled out with your information, so there is nothing for you to fill out. The Challenge will accept all old, damaged and out-of-use cell phones, smartphones, wireless PDAs, and pagers. We will also accept rechargeable cell phone batteries and accessories, but these will not count towards your total. We do not accept cordless phones, walkie-talkies, non-wireless PDAs, Mp3 players, any battery not commonly found in a cell phone (example: single use batteries, rechargeable AA batteries), laptop computers or answering machines. What happens to the phones and other items that we collect? Mobile devices that are collected are sent to GREENTEC for processing. Shipments arriving at GREENTEC are sorted, evaluated and tested to assess their functionality. Phones are first tested to assess their ability to power on. Devices which power on then receive a data wipe to remove any confidential information which may have been left on by the consumer. Components, including the LCD screen, keypad, battery, antenna and casing, are evaluated. Phones deemed to be in good condition are then inspected for water damage and “call tested” to confirm their functionality. Phones that pass as functional are then sold for reuse. Phones that do not power on, or do not pass the functionality evaluation, are separated for material recovery by recycling. Devices are broken down to their base components (metals or plastics), and then sent to approved processors. Recycle My Cell Earth Month Challenge eligibility criteria can be changed without prior notice.